Treating cat vomiting will depend on the severity and the cause! Generally speaking, a single vomiting episode is not cause to take your kitty to the veterinarian. Even though your cat may only vomit once, it is always advisable to keep him indoors for at least 24 hours for observation. Withhold food and restrict water intake to small laps every half hour. Examine the vomit for any foreign bodies, hairballs, blood or bile. You will also need to check the litter box for potential diarrhea. If your cat shows no further signs of vomiting or diarrhea and no other signs of illness, then you can re-introduce water and a diet of boiled rice and chicken. Kitty can be fed small amounts every 4 hours and after 24 hours you can progressively introduce his normal diet. Boiled rice and chicken is ideal, as it is low in fat, low in fiber and highly palatable. 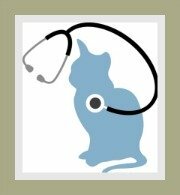 We always recommend that if you are concerned about the health of your kitty that you consult a vet. 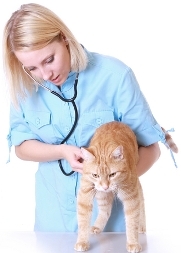 The veterinarian will do a thorough physical examination of your cat to establish the cause of the vomiting. Treatment will depend on the cause and severity of the cat's vomiting. Depending on the severity, your cat may be hospitalized. If your kitty is dehydrated, the vet will provide intravenous fluids to replace lost fluids and electrolytes. The vet will administer medication (an anti-emetic / anti-nausea) via intra muscular or intravenous injection to control the vomiting. In order to exclude or confirm diseases of the kidneys, liver, thyroid or diabetes, the vet will do a range of blood tests. Blood tests will also establish if your cat has a bacterial or viral infection. Sonars or X-Rays to establish physical abnormalities of the gastrointestinal tract like tumors or an obstruction. An endoscopy will be done under anesthetic to explore the stomach and possibly do a biopsy for further examination. In the chapter on feline vomiting we discuss the causes of vomiting. Food-related vomiting will require an adjustment in diet. Infections will be treated with antibiotics. Intestinal parasites will be treated with de-worming agents. Poisoning will, where possible, require the administration of an antidote. Obstruction of the gastrointestinal tract will require surgery. Cancers / tumors may need surgical intervention as well as chemotherapy. Disease of the thyroid, liver or endocrine system (diabetes mellitus) will require relevant and appropriate disease specific treatment. Inflammatory diseases of the bowel may require antibiotics, anti-inflammatories, steroids, probiotics and diet adjustment. Diet is one of the major causes and it is critical that you feed your cat the highest quality cat food whether it's a raw diet, wet diet or commercially produced dry kibbles. Ensure that you store your cat's food in an air-tight container, refrigerate where necessary and never feed your cat expired or spoiled food. 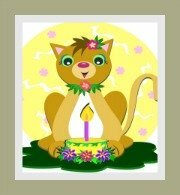 You should avoid changing your cat's diet unless there is some medical reason to do so. 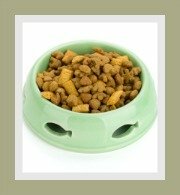 Where possible, feed your cat small and regular meals, this prevents gorging and also helps to control the amount of food your kitty consumes. 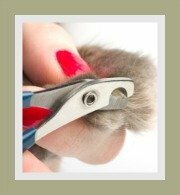 Reduce hairballs by grooming your cat frequently and using hairball prevention treatment as prescribed. Be sure to take your cat to the vet at least once a year for those very important vaccinations (to avoid infectious feline diseases) ; for the treatment of intestinal worms and a general health check-up. 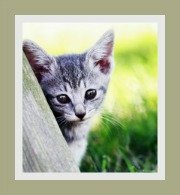 Indoor cats that have a safe and enclosed outdoor adventure zone are less likely to contract infectious diseases or eat contaminated and poisoned food than cats that are allowed to roam freely. 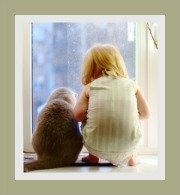 We trust that you have found the tips and advice useful and that your cat or kitten will soon be better. If in doubt - always visit your veterinary clinic.